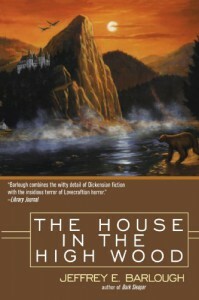 Jeffrey Barlough's second novel in his Western Lights series is another wicked marriage of Dickens and Lovecraft. However, where in Dark Sleeper the focus was on the Dickensian half of the union, in House, the Lovecraftian half comes to the fore. The blurb at the back of my edition says, "The nightmare has come home again...," and it doesn't end. I was actually surprised at how thoroughly bleak and hopeless the ending was; no one escapes the savage vengeance of the revenant who returns to the village of Shilston Upcot to exact her revenge on the people who abandoned her 30 years before. And it's very effectively done. Like the Victorians he emulates, Barlough's pacing is very deliberate and measured (perhaps too much so for many modern readers), leading the reader to anticipate a final scene where the villagers overcome the ghost. Reflecting back, however, the outcome is foreshadowed by the framing device: A traveler mets a man along the coach road through Shilston Upcot who explains to him why the village is abandoned. I just didn't expect the reason to be so harrowing. I liked this book somewhat more than Dark Sleeper, perhaps because I prefer Lovecraft to Dickens, and would recommend it highly. Another thing I like about Barlough is that, though set in the same alternate Earth as his first novel, House is a completely self-contained novel and can be easily read and understood without reference to others in the series. I hope this may become a general trend in SF and fantasy.